Conceived by Reece Shearsmith and Steve Pemberton (The League of Gentlemen) and directed by Matt Lipsey (Little Britain), this 2009 British comedy series boasts a pristine comedy pedigree. Featuring a cast of madcap grotesques that strongly bring to mind the comedic creations of Matt Lucas and David Walliams and incorporating surrealist elements reminiscent of The Mighty Boosh, series one of Psychoville at times wears its influences on its blood-spattered sleeve, but over the course of its seven episodes ultimately manages to stand on its own merits. By turns dark, weird and uproariously funny, the series charts the fortunes of six mentally unstable characters residing in different parts of England. There’s Mr Jelly, a foul-mouthed clown with a hook for a hand who ekes out a living terrifying children at birthday parties; Oscar Lomax, a blind eccentric millionaire who collects stuffed toys; David Sowerbutts, a murderous man-child who lives with his equally bloodthirsty mother Maureen; Joy Astin (Dawn French), a midwife who believes her rubber training doll is a living breathing child; and Robert Greenspan (Jason Tompkins), a lovelorn dwarf who refuses to accept his Snow White will never love him. Each of the six is being blackmailed by a mysterious black-clad stranger, who delivers handwritten notes of an increasingly sinister bent. As the series progresses (and the bodies pile up) the link between each of the deranged protagonists becomes clear, and all must come to terms with the haunting misdeeds of their collective past. 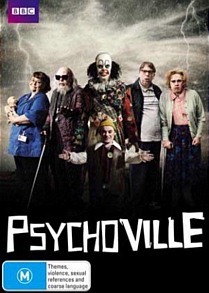 Psychoville is a highly successful black comedy as well as an arch whodunit. Ever so occasionally it feels like a pastiche of shows that came before, and Shearsmith and Pemberton’s characters sometimes come across like Little Britain cast offs, but there’s more than enough humour, intrigue and mayhem to compensate. Furthermore the writing is flawless and both French and Tompkins inhabit their characters completely, lending a believably psychotic air to the already unhinged proceedings. It’s great fun, and yet another worthy entry into the every-expanding oeuvre of inventive, genre-bending British comedies. Complimenting the strength of the material, the DVD release is a solid one. Each episode features funny and incisive audio commentary from Shearsmith, Pemberton and Lipsey, and also on offer are behind the scenes footage, cast and crew interviews, a split screen ‘making of’ option on Episode Four and a photo gallery. The picture has a filmic quality to it and there are certainly no complaints about the excellent visuals, and though the soundtrack is a 2.0 it performs admirably, packing a wallop and infusing some of the more Hitchcockian moments with a suitable mien of dread. Psychoville is clearly a labour of love, and it shows in every frame. Both a throwback to vintage noir and a fresh, modern take on the mystery genre, this is one series guaranteed to leave you wanting more.